From the mid 1970s through the late 1980s, students and faculty at the University of Michigan participated in the nationwide campus-based protest movement against university investments in corporations with ties to apartheid South Africa. "Divestment for Humanity" explores more than a decade of anti-apartheid activism at the University of Michigan, with close attention to organizations in the surrounding Ann Arbor community, political developments in the state of Michigan and at the national level, and events at other campuses across the country. This exhibit shows how campus anti-apartheid activism grew out of the anti-Vietnam War and civil rights movements, details the expansion and climax of the divestment campaign, and assesses the legacies of this history of international human rights activism at the University of Michigan and beyond. The anti-apartheid movement at UM operated in close collaboration with national organizations and activists on other campuses; built a protest network that connected students, faculty, Ann Arbor residents, and Michigan politicians; precipitated a lengthy legal battle over divestment and autonomy between the University of Michigan and the state government; ultimately played a vital role in forcing UM to divest fully from American firms with investments in South Africa; and left behind powerful legacies and protest models for future generations of activists. "Divestment for Humanity" is a public history exhibit created by a team of five undergraduate students at the University of Michigan during the Winter 2015 semester in History 497: "Global Activism at UM: The Anti-War, Anti-Apartheid, and Anti-Sweatshop Movements." The three website exhibits produced by student teams in this course represent the first installment of "Michigan in the World: Local and Global Stories," a public history collaboration between the Department of History and the Eisenberg Institute for Historical Studies. The "Divestment for Humanity" exhibit explores one of the most consequential but understudied mass social movements of the modern era and provides one of the first scholarly accounts of the campus anti-apartheid movement in the United States during the 1970s and 1980s. The design of the online exhibit combines a historical narrative and dozens of images with more than two hundred full-text archival documents, allowing the audience to explore original sources and multiple perspectives in depth. The goal is to provide an interactive resource for students in high school and college classrooms while recounting this pivotal historical episode for a general public audience as well as contributing to the 2017 bicentennial commemoration of the University of Michigan's history. Visit the About page for additional information about the "Divestment for Humanity" research team and the "Michigan in the World" project. Click the Exhibit link to begin exploration of the history, images, and archival documents of the anti-apartheid movement at the University of Michigan and beyond. 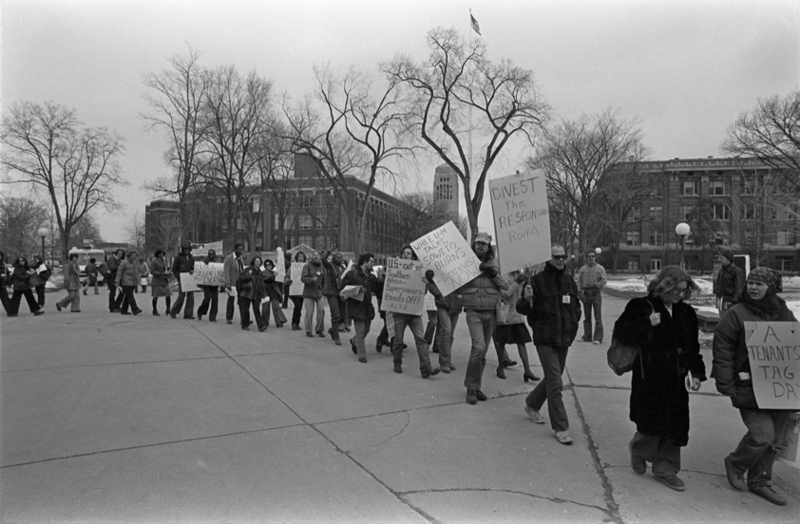 Image Credit (above): Campus protest demanding University of Michigan and United States divestment from apartheid South Africa, March 16, 1978, The Michigan Daily Photo Archive, Bentley Historical Library, University of Michigan.